Kuwait is a melting pot of communities - from North Koreans to Americans to Filipinos to Indians to Kenyans to Samoans to Fijians - and to make calling Kuwait easy for everyone, simplecall, has created a cheap and easy to use international calling service. Our prices are low and our quality is high. Our product features a PINless dialling service which saves you the headache of dialling complicated PINs when you want to make an international call. 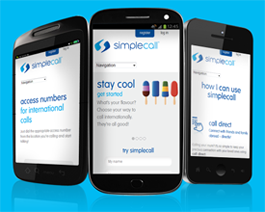 simplecall is known among its customers for its reliability and great call quality. Our cheap rate for Kuwait is just 6.64¢ /min for both the landline and mobiles. To start enjoying our cheap calling service all you need to do is just visit our website at www.simplecall.com and register for free. With simplecall you don’t have any hidden charges and we have a dedicated 24/7 customer care centre which is there to serve you if you should ever need extra help. Kuwait is a small but important country in the Middle East. It has about 8% of the world’s oil reserves. The increasing global demand for oil is attracting more investors and workers to Kuwait. Call Kuwait today with simplecall and stay in touch with your loved ones.